Sirsa, Haryana: Five months after an impressive show in the Lok Sabha polls in Haryana, the Bahujan Samaj Party (BSP) appears to have lost political momentum in the run-up to the state’s assembly elections due on 13 October. This could augur well for the incumbent Congress, which feared that a rejuvenated BSP could play spoiler in a multi-cornered contest by weaning away the crucial Dalit vote bank. BSP’s vote share in the Lok Sabha was a marked improvement over the last Haryana assembly polls in 2005, where it won just one seat and polled 3.44% of the votes, while the Congress swept the polls winning 67 seats with 42.46% of the votes. So far, Mayawati, the BSP’s public face, has stayed away from the campaign in Haryana even though she has pressed into service six of her ministers from Uttar Pradesh for electioneering in Haryana. 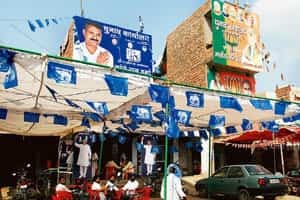 In the districts of central and western Haryana such as Hissar and Sirsa, among the areas that the party did well in the Lok Sabha poll, BSP’s ground-level campaigning has been low key to the point of being invisible in some places. “The voters of BSP have a very typical nature (of) being silent and to remain unnoticed. The vote share of BSP remains intact irrespective of the issues in the electioneering," writer and columnist Badri Narayan said, pointing to the dangers of reaching hasty conclusions about the BSP. While this may be the case, it is apparent that it is not smooth sailing for the BSP. The curious case of the BSP’s Lok Sabha candidate from Hissar, Ram Dayal Goyal, who received 90,277 votes compared with the winner Bhajan Lal’s (of Haryana Janhit Congress, or HJC) 248,476 votes showcases the party’s problems. According to Goyal, he resigned from BSP about a month and a half ago. Goyal told Mint that he has begun to help the Congress’ assembly election campaign. However, BSP’s Haryana chief, Prakash Bharti told Mint that as far as he was concerned, Goyal continued to be a part of BSP. According to politicians from other parties and analysts, support for the BSP among voters and politicians peaked during the last Lok Sabha election as there was widespread belief that the party’s leader and Uttar Pradesh chief minister Mayawati had a realistic chance of becoming prime minister. After the Congress emerged winner in the Lok Sabha polls, some politicians and voters began to drift away from the BSP in Haryana in keeping with their local priorities, they added. BSP’s leaders disagreed with the assessment and said they were upbeat about the party’s chances in the coming assembly elections, where the incumbent Congress government is expected to retain power though with a reduced majority. Goyal said the BSP couldn’t meet expectations that it would consolidate its vote, explaining his departure from the party. Goyal’s sentiment encapsulates a confluence of factors which appear to have slowed the BSP’s growth in Haryana. Initially in the run-up to the assembly polls, the BSP did get off to a good start, allying with former chief minister Bhajan Lal's’s HJC, a breakaway faction of the ruling Congress. However, ahead of the assembly elections, BSP split with HJC. BSP and HJC have different versions of why the alliance fell through. The development, however, was a missed opportunity for both parties and INLD may benefit as a result, said Satish Tyagi, Haryana-based political analyst and a columnist in Hindi newspapers. “For BSP, the alliance with HJC could have been very beneficial. The non-Jat voters could have opted (for) them as a choice. But with the opposition divided, it is tough to predict the results while it’s a sure loss for BSP," Tyagi said. Jats, an agrarian caste, are the dominant group in the state. According to politicians in the state, Jats make up between 28% and 29% of the population. The Congress chief minister Bhupinder Singh Hooda, and the INLD chief, Chautala, are both Jats. Dalits, the main support base of BSP, made up 19.3% of the state’s population compared with a national average of 16.2%, according to the 2001 census report. “I can only feel sorry for (the) BSP. It would have been a good alliance but we are better alone and we would form the government," HJC chief Kuldeep Bishnoi told Mint. “Janhit Congress was insisting on an alliance with BJP which was not acceptable to us. We were forced to break the alliance because Kuldeep Bishnoi seemed to have some plans of a grand alliance with BJP (Bharatiya Janata Party) on board," Mansingh Manhera, BSP’s national general secretary, who has been entrusted with the strategy for the party’s Haryana campaign, said. Bishnoi felt BSP would not be able to top or even equal its Lok Sabha poll vote share, as in May the party’s support base was galvanized by the prospect of Mayawati becoming prime minister. Within Haryana, BSP does not have a Dalit leader who could be showcased as a potential chief minister which, in turn, affects its prospects, he added. With the Congress improving its tally and emerging as the pivot for the United Progressive Alliance (UPA) government, some recent entrants have drifted away. BSP state chief Prakash Bharti said the party is least bothered about “opportunists who come and go". Some of Haryana’s politicians have jumped onto the BSP bandwagon to take advantage of an increase in its popularity over the last couple of years, Tyagi said. After the Lok Sabha polls, as the BSP’s immediate prospects seemed to have worsened, some of the party’s fairweather friends have begun to drift away, he added. In Haryana, the BSP remained undaunted by its overall performance in the Lok Sabha polls. “We are continuing with the social engineering formula which brought us good results in the Lok Sabha polls. We would come out with better results this time. Our party would emerge the most important entity after the results are announced," Manhera said.